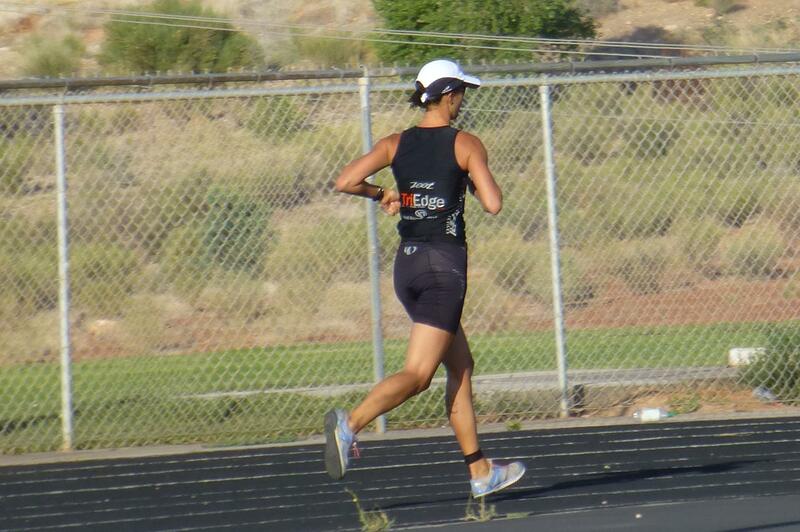 It’s been just over a month since Ironman St. George and it was time to dust off my racing shoes again! 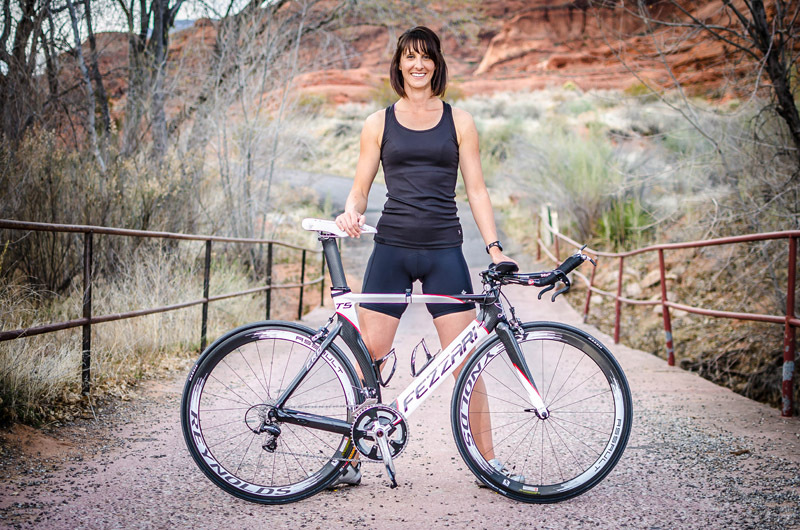 The past month has been filled with recovery and change over……..it was time to find my “FAST”! 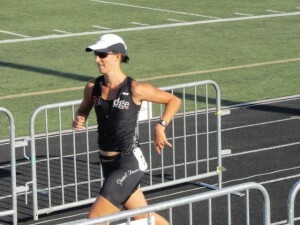 With Ironman 70.3 Lake Stevens looming not far in the future, Coach M has been pushing my speed. This race would be the first time I really let any of that speed out of the bag to see what I would get. 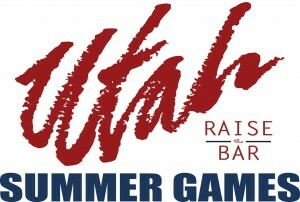 Last year I didn’t compete in the Utah Summer Games because I was out-of-town racing in Park City, Utah. This year, I was home and I wasn’t going to miss what everyone reported as an AWESOME new course and venue. 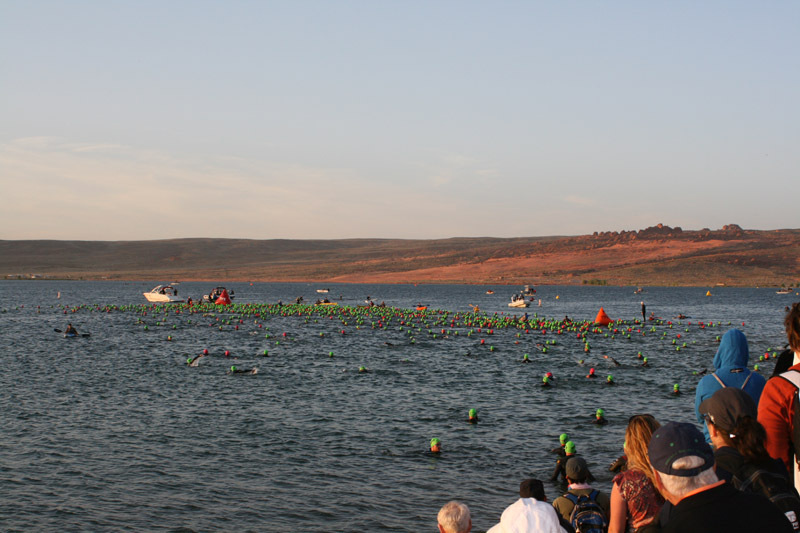 For years, the Summer Games has been held on the same course out at Sand Hollow as all of the other local shorter distance triathlons. 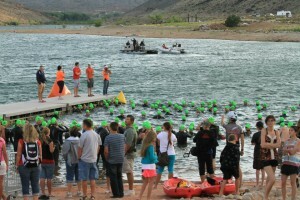 In 2011, under new race directors, the race was relocated to Gunlock Reservoir. What a GREAT change! On Friday, I picked up my packet as early as possible and headed to the reservoir to rack my bike and meet up with some friends for a dip in the open water. Since I have never have swam in this reservoir, I wanted to check it out prior to race day. I LOVED IT! I need to swim in Gunlock more often!!!! It has a bit more of a mountain-lake feel to it. I’m really not fond of being able to see all the way through the clear water of Sand Hollow to the bottom (where all the fish live), so I LOVED the greenish water that kept me from seeing even people close to me Water temperature was perfect and I was ready for the next morning………though I didn’t know if my legs were. Like I mentioned, Coach M has been putting me through my paces with lots of tempo and speed work in all three sports. This week was just like the rest with hard early-week swims and bikes and track to finish off my legs on Thursday. 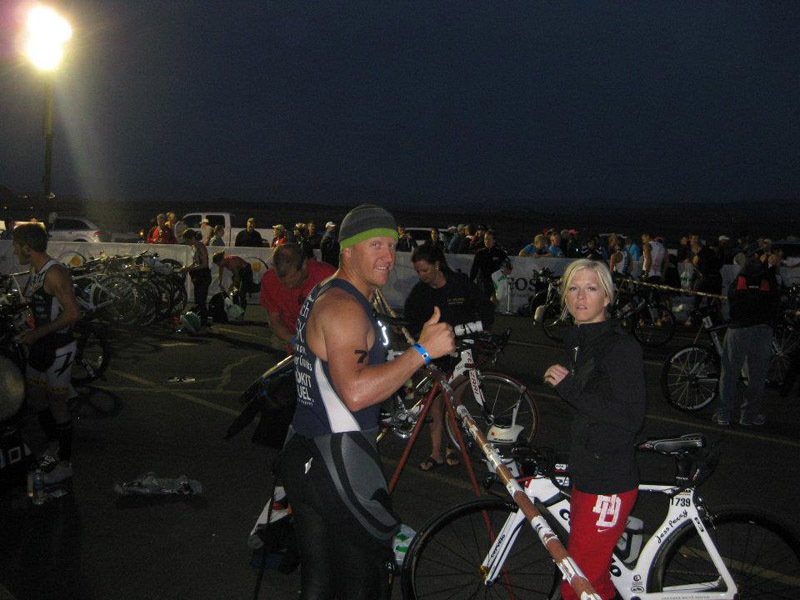 Friday I was stiff and sore and new that I wouldn’t necessarily be racing on fresh legs. Saturday morning we boarded the shuttles at T2 before the sun was up. As we were driving up the road we would soon be riding down, I realized it was windy……..REALLY windy! The wind was howling from the North! I actually had to laugh. 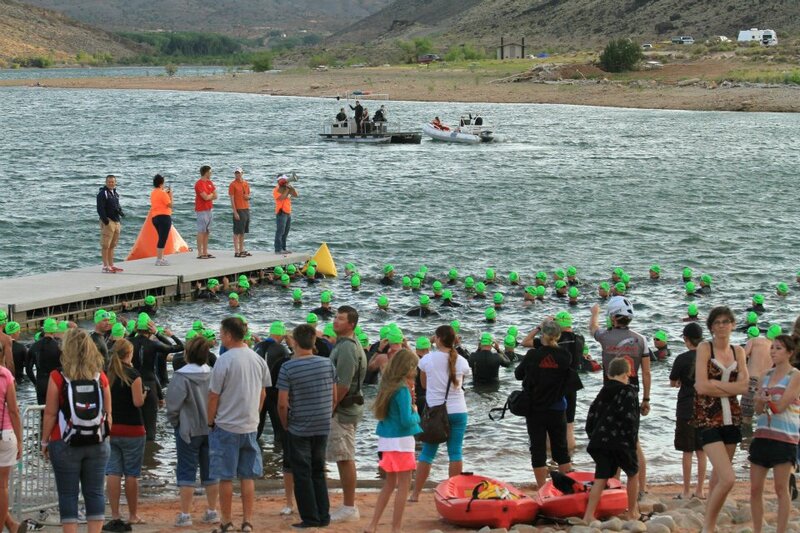 Once again, Mother Nature wasn’t going to make racing easy for triathletes. This cycle has to break at some point…….just not yet, I guess. The water looked choppy, but didn’t have any white-caps. I did a quick mile or so run with my training partner Craig and then got a few strokes in the water before being kicked out so final preparation of the boat ramp could be made. Now that is focus……..or me just trying not to pee in my wetsuit before I hit the water! I felt good! I felt ready to race! I love that I’ve been in this “business” long enough that the nerves are actually comforting. They are just enough to make me excited, but not enough to drive me crazy. The men hit the water 5 minutes before the women. Our wave was fairly small. I decided to go wide and to the right as to avoid all the traffic. It worked beautifully and before I knew it I was at the heels of some of the men at the first bouy turn. With the swim being so short (750m), my strategy was to go out hard to clear the mess, settle in after the first turn, and then drive it home after the second turn. The water was much choppier than I thought it would be. 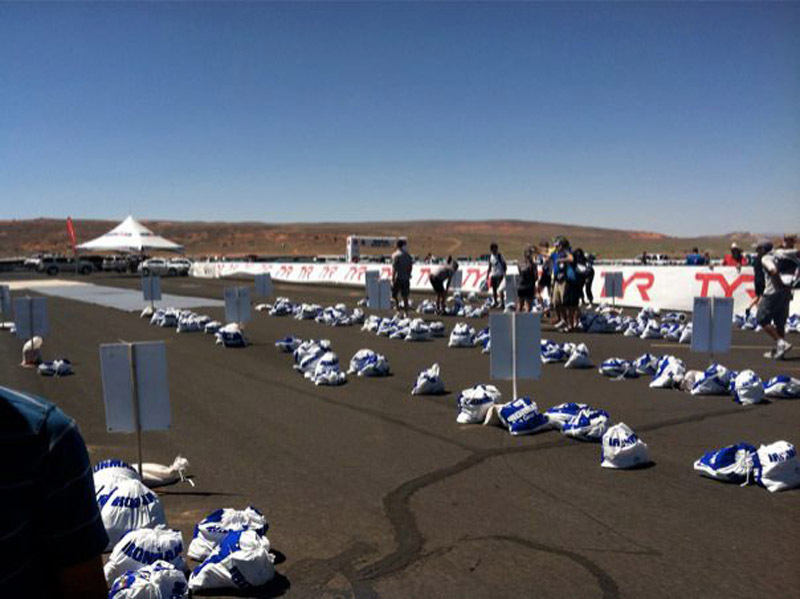 It wasn’t Ironman St. George crazy or anything, but it did present a challenge. When I approached the first buoy there were 4 or so people dangling off the permanent marking buoy bouncing up and down. As I rounded the first corner we swam a bit more with the wind and got the benefit of the swells from behind. I was swimming smooth and felt good. I was passing a lot of men, but didn’t know my standing among the women, since everyone was wearing the same color cap. As I made the turn on the third buoy, we headed back across the lake and the water became choppier and a bit harder to navigate. It was tough spotting above the swells, especially into the rising sun that had just peeked over the mountain top. My goggles were beginning to fog and DRIVING ME NUTS! 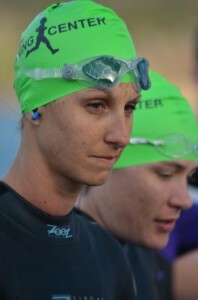 I even had to breaststroke a few times just to clear them out to try and see a bit better. I don’t think it helped. The sun was blinding whether they were fogged up or not. We mounted the bike straight into the wind, but quickly had it at our back as we began to descend back into town. The bike course is a speedy one! Being net downhill, you get flying…….with a tailwind……..you can only imagine. As I hit the first steep downhill right off the reservoir, I actually had to brake to keep a bit of control. 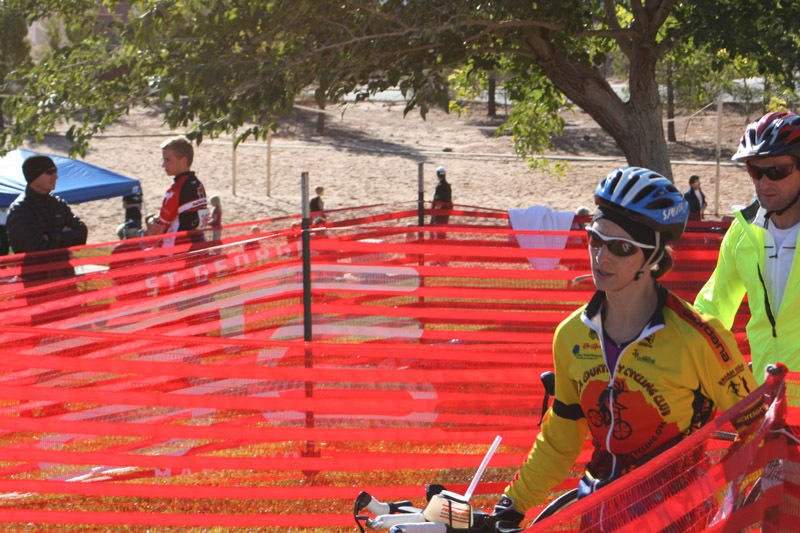 This course DEFINITELY favors a heavier, fearless athlete. I knew that I was going to have to ride a bit out of my comfort zone to keep pace. I also just wanted to have a good bike. With all the messy conditions that I’ve raced in this year……..I just wanted a race to come together. I wanted to feel all my hard work paying off. My bike was solid. I was focused and riding well. I knew things were going my way. The tailwind subsided as we got out of the canyon, only to change over to a headwind into town. 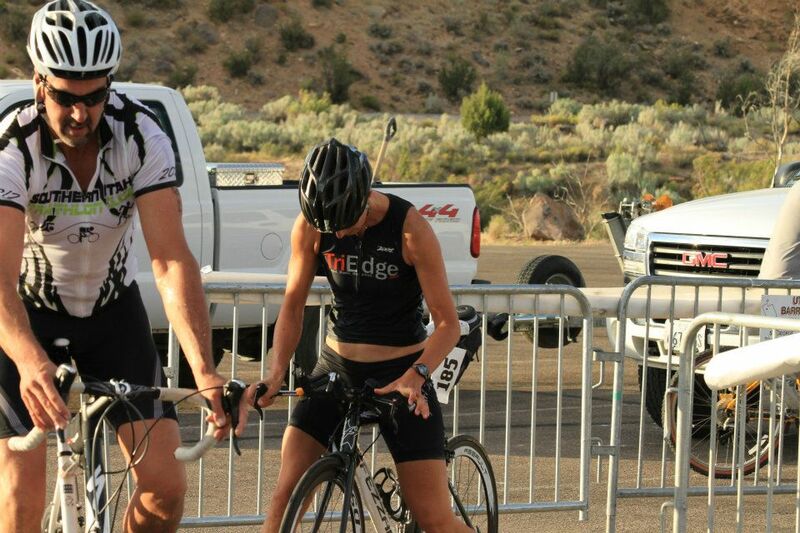 Luckily, the wind wasn’t that strong on this portion of the course and I felt that I could get down in my aerobars without even noticing it too much. Even though this is a downhill course, there are uphill portions. I just maintained the intensity and focused on using good form to push up the hills. Before I knew it I was turning off of the highway and was only 2 miles from the finish. Just before the final turn before T2 I started to come upon some GREAT male bikers. I was pretty happy to be in their company! I had a smooth T2 and was out rounding the track to the run course. With such a short run, I knew I just had to go and go hard. There were good runners behind me and this was where I needed to hold it together. The run course is a moderately hilly course on a bike trail. The way out and after the turnaround have some little hammy-biting rollers that can really eat your speed. I just had to stay in my head and focused. I loved that this was an out-and-back course and I got to see all the men who were in front of me. I had no idea if there were women, so it was comforting to see that I was leading the group. 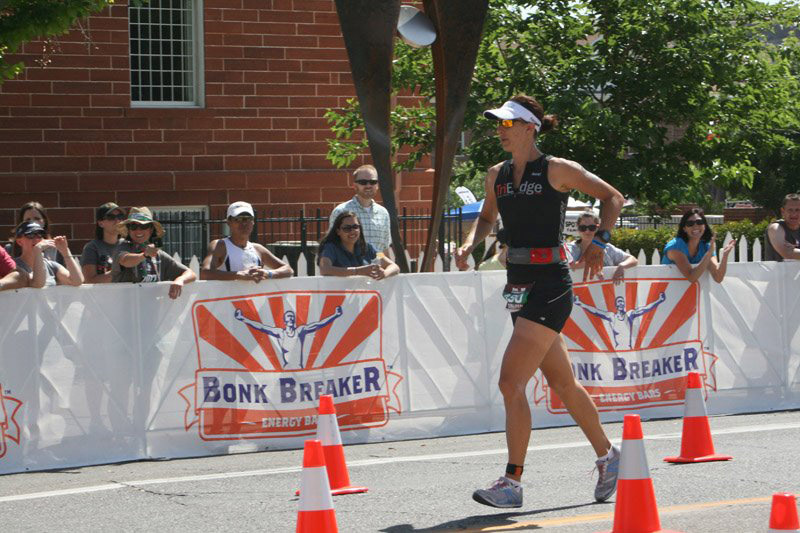 I actually didn’t see the second female until I was about a mile out of the finish. I had opened up a significant lead. The last mile of the run is a nice steady decline before a short hill back onto the track for the finish. It was over before I knew it as I ran onto the track. I finished and FELT GREAT! It is so good to finish strong! Of course, we all like to win. It’s a great feeling, but this was one of those races that I NEEDED to win. I needed a day that came together to put my mind at peace. Over the last few weeks I had really struggled with the “am I good enough” question. 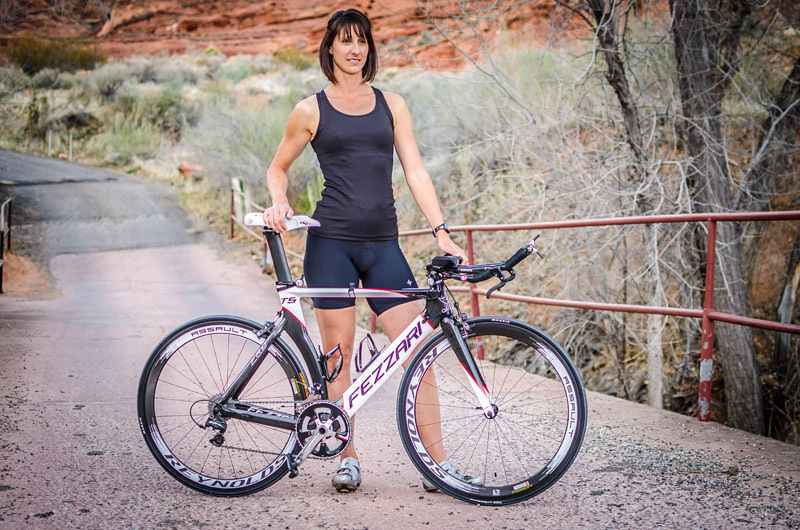 With Lake Stevens and a shot at the 70.3 World Championships only weeks away, I was feeling the pressure to perform, and perform well. I know that I have to put it all on the line at Lake Stevens for the shot at Worlds. My legs are going to have to show up and I’m going to have to have the mental strength to keep up with them. This win at the Summer Games helped to settle my mind. Besides just winning, the best part of this race was that I performed where I expected to perform. I had a solid swim in 18:04. Clearly, this course was long…..VERY LONG, but we don’t have exact numbers. (It has been estimated about 950-1000m.) Considering, I was very happy with the effort. On the bike I had the 12th fastest bike of the day (on a downhill course with LOTS of BIG guys). I averaged over 25 mph and just felt solid! My run wasn’t my fastest 5K ever, but considering I wasn’t on fresh legs (in the least), I’ll take the 21:25 and the sub-7:00 pace per mile. It just felt good for it to come together. All tolled I ran a 1:16:37 and I was tied for 5th overall. 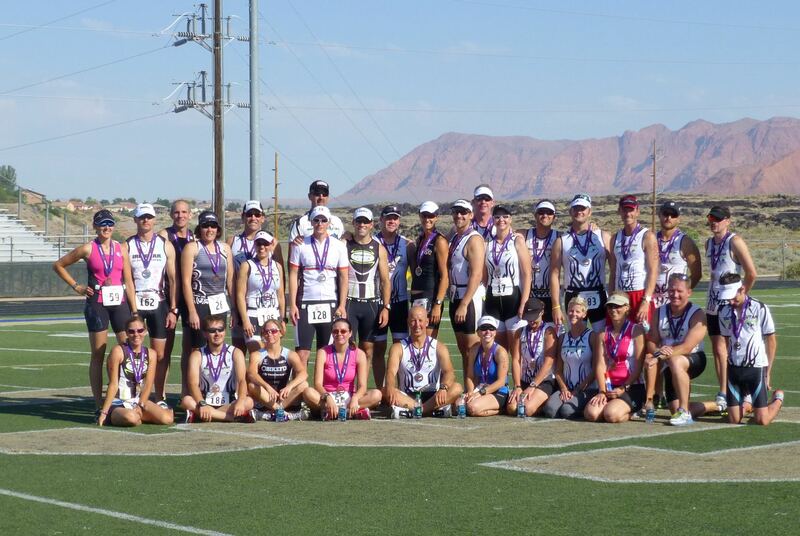 Good looking group of Southern Utah Triathlon Club members! This race snapped me out of a mental slump and helped my focus for these last few weeks before Lake Stevens. 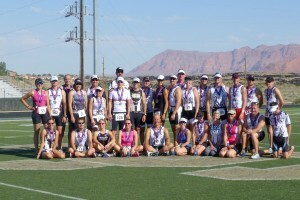 Big thanks to the St. George Running Center! 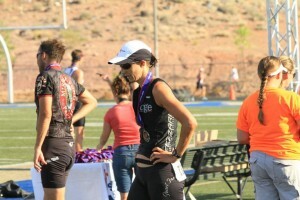 These guys are GREAT supporters of the local triathlon and running community and I appreciate all they do on my behalf.